Today I’m talking with the Chief Medical Officer for The Crisis Text Line. 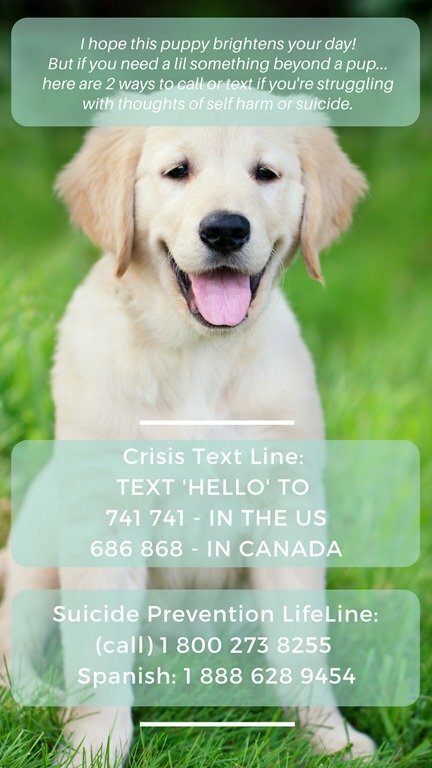 It’s a free confidential text message service for people in crisis. Anyone can text 741 741 in the US or in Canada text 686868 – and services are available 24 hours a day. There’s been a lot of talk about suicide on social media and in the news with the recent passing of Anthony Bourdain and Kate Spade. Sadly suicide is on the rise in the US – Suicide is the 2nd highest cause of death for people age 15 to 24. It’s tragic and if nothing else it gives us an opportunity to talk about it. So… that’s what we’re doing today. I want to share this resource in case you or anyone you know needs it. And because I mention it during the interview I’m going to start off by sharing how I first went to therapy and why I’m so comfortable talking about this stuff. My name is Monica and I started Run Eat Repeat over 9 years ago to talk about training for my 1st marathon and weight loss struggles. I fell in love with running and with sharing my story so the site grew into an amazing community and now this show! 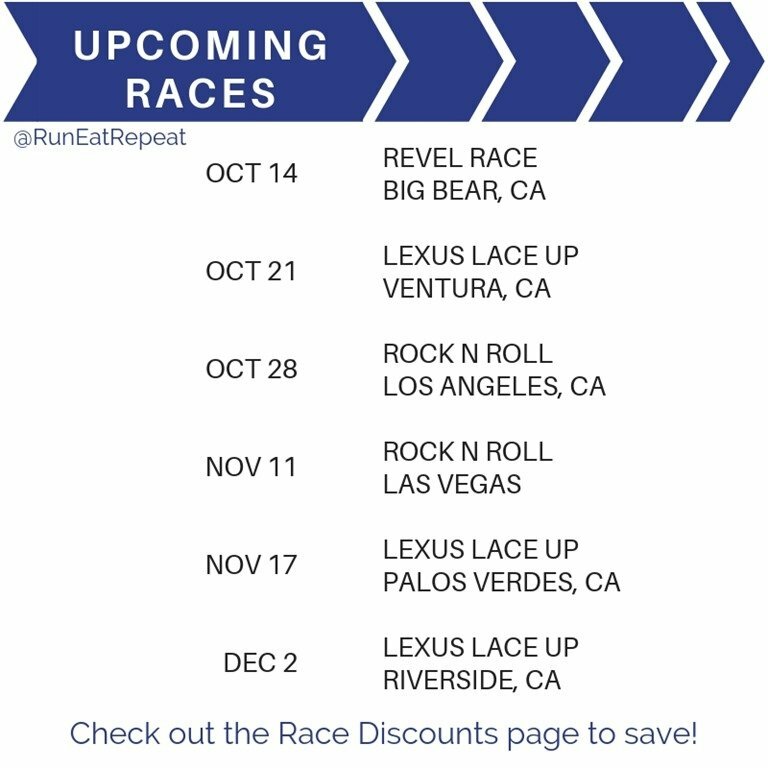 Check out Run Eat Repeat.com for training tips, recipes and random life updates! Welcome welcome!! I talk about going to therapy a lot and I joke about it a lot too. I estimate I’m joking 86% of the time. But I want to talk about something serious today with covering the topic of self harm, mental health and suicide while trying to make it feel like a normal conversation, ya know? I talk about mental health a lot. 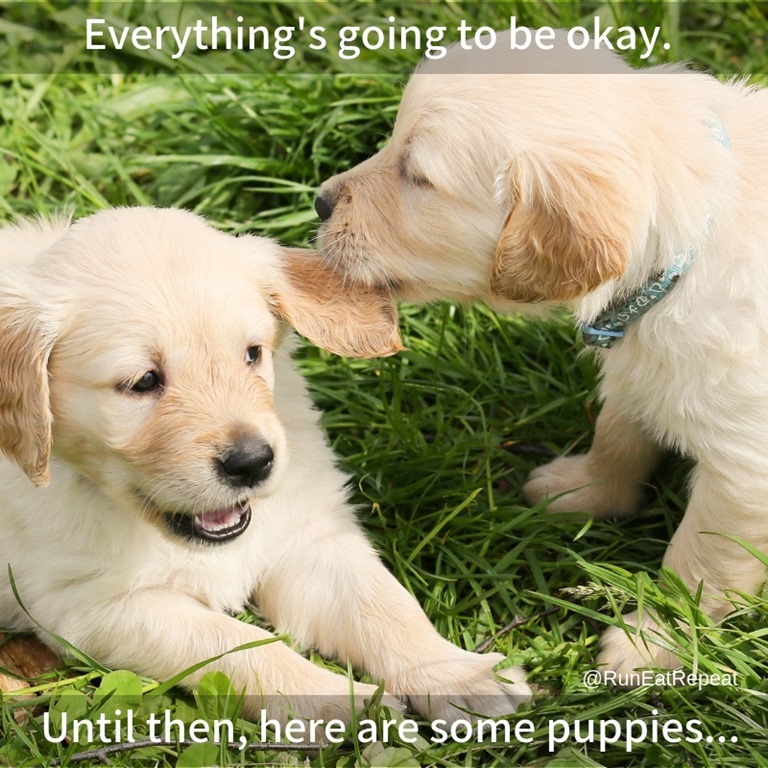 I think it’s okay to not feel okay. I think it’s okay to go to therapy. I think it’s okay to be open about mental illness – just like it should be about an illness like diabetes or hypothyroidism or a broken bone. 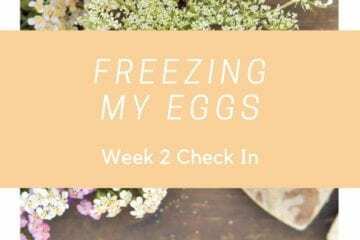 I mention on the call that I went to therapy in college and I wanted to share my first experience – why I went to therapy originally and how I got started going and finding a therapist. And it occurred to me that while I think it’s cool to talk about therapy and mental health – not everyone feels like that. Maybe someone is embarrassed about it? Or maybe you think therapy isn’t necessary?? So I was curious – why do I think it’s okay to go to therapy? And I realized because no one ever told me it was weird. And because it was such a normal part of life and conversations with my first long term boyfriend in college. I just realized this! I used to go to Sunday dinners with his family and sometimes they’d talk about therapy like it was another hobby. It wasn’t any different than any other dinner conversation. So I thought – oh, I should check that out… and I did. I was in college and still on my mom’s health insurance. I just looked on the back of my insurance card and called the number to see how I could find a therapist. I went to someone they referred me to, paid my co-pay and had one or two sessions with a female therapist a few cities over. Moral of the story – I thought all of this was very no big. So I feel comfortable talking about mental health the same way we might talk about missing a sale on running shoes… or something more serious? I want everyone to be more comfortable talking about this – which is why I wanted to share the number to the text line and other resources. And also wanted to remind you that sometimes I joke about serious things – not because I don’t take them seriously, but because to me it’s not very different from the fact that I’m into running or cooking or failing at doing perfect eyeliner even after 288 tries. I want to encourage you to be open minded – to everything and everyone. Be kind (to yourself as well). Extend everyone grace that they might be having a hard time, might not know how to express themselves, might not understand how you feel. Offer help if you think someone else does. Don’t take it personally if someone doesn’t want to talk to you. But offer to be there if they do. tell everyone that you love them (and tell them to listen to the Run Eat Repeat podcast). 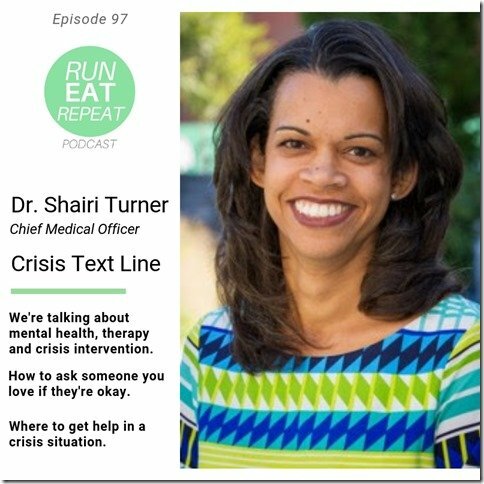 Today I’m talking to the Chief Medical Officer with the Crisis Text Line Dr. Shairi Turner. Dr. Turner has a Master of Public Health from the Harvard School of Public Health, a Medical Doctorate from Case Western Reserve School of Medicine and a Bachelor of Science from Stanford. 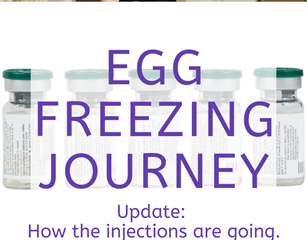 She trained at Massachusetts General Hospital and the Children’s Hospital of Boston. Before taking her current position she was Chief Medical Director of the Florida Department of Juvenile Justice and former Deputy Secretary for Health at the Florida Department of Health. Her resume and advocacy are beyond impressive. And I’m very happy to have her on the show today. 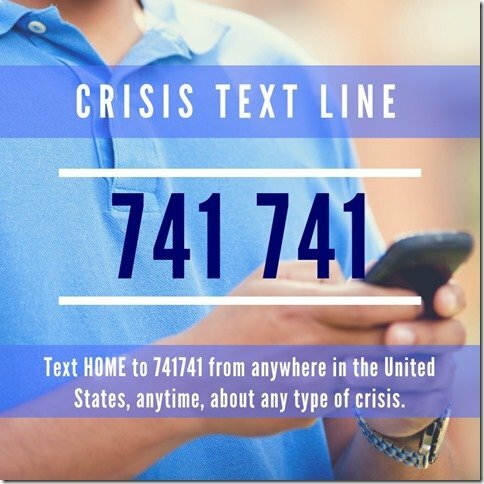 What is the Crisis Text Line? Why is suicide on the rise in the United States? Suicide is the 2nd highest cause of death for people age 15 to 24… Why is that? How social media can impact mental health? How do we keep an eye out if we think someone is at risk for hurting themselves? What do we say or do if we think someone we know may be at risk for hurting themselves? Always Ask – when someone contacts the Crisis Text Line they always identify and ask if someone is thinking about hurting themselves. 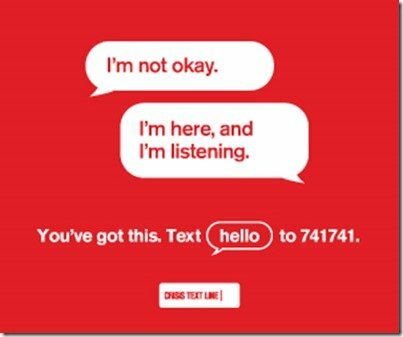 Reminder – The text line is a crisis resource. If you need support or someone to talk to please reach out to your health center at school, look into therapy or mental health resources, check your health insurance options. 1. Name something that is awesome about YOU! 2. Share the Crisis Text line on social media or somewhere that can be passed on and maybe help someone. I’ll also be posting on Instagram and Facebook so you an share from there directly. 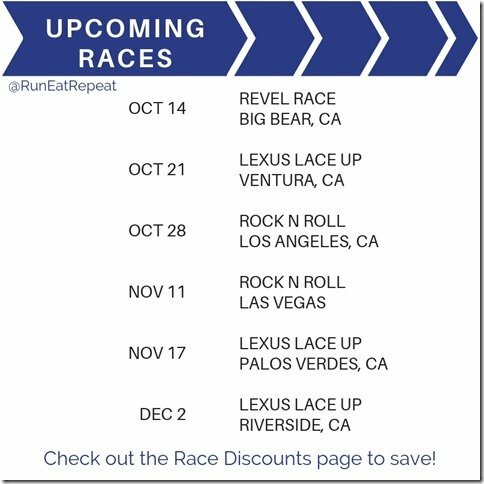 Check out the Race Discounts page to save on Rock n Roll LA, Rock N Roll Vegas, Lexus Lace Up, Run Revel and more!! All the discount codes and links are on that page!